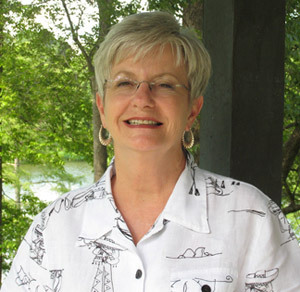 My name is Debbie Maddy and I live in a small town in north Texas with my husband of 38 years. We have two grown sons. Probably like many of you, I learned to sew as a young girl. I did all kinds of needlework and was a garment sewer until 1982 when I learned to quilt. My first quilt was a king-sized sampler cut with paper templates and hand stitched. When I discovered the rotary cutter I felt like I had been riding a horse and had bought a new car. I took every class I could and tried to soak up the knowledge of every teacher. I soon discovered that no matter what class you are attending or what teacher is teaching, you can always learn something. I soon learned how much I enjoyed sharing my knowledge. I have been teaching quilting now for about 16 years and love every part of it. I mainly travel to lecture and teach for guilds and some shops. I will teach a private class for eight ladies close to home this weekend and I will be in The Villages, Fruitland, & Leesburg, Florida next week. I have tried to put a lot of energy into teaching new quilters and designing quilts using what I call my No Diamonds / No "Y" Seams technique. The quilts are based on old designs that used diamonds, but are made with half square triangles. 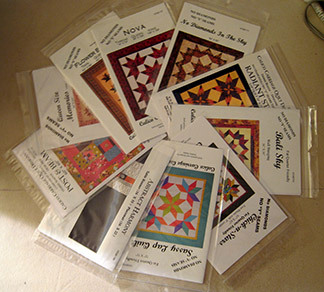 In 2002 I started a pattern company called Calico Carriage Quilt Designs®. The majority of my sales are wholesale to shops but I do have a website to promote my products and do some retail sales there. 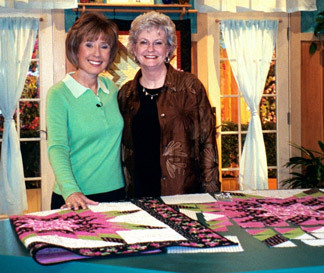 In 2005 I was invited to tape a segment of Simply Quilts with Alex Anderson and that was a wonderful adventure! 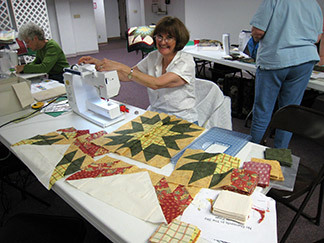 In 2006 I retired from 35 years as a dental hygienist to make quilting my full time job. I started my blog to bring people to my website, but have since discovered that I really enjoy just sharing my travels and experiences with others. I like to share the pictures of classes to inspire others to start something new and to share the fun of taking a class. I like to share the places I travel to because I enjoy reading about where other people have been. 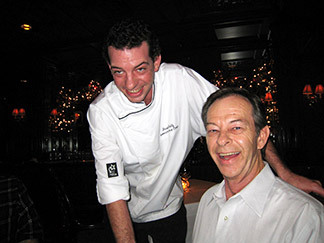 I like to share recipes and restaurant information because food is a very important part of our lives. My youngest son and his girlfriend are both professional chefs. So you can see my life is never boring. I am going to be giving away a group of 10 patterns. All you have to do is leave a comment on my blog and I will do the random drawing on March 11, 2009. I hope to meet many of you on the blog or in my travels. Thanks for making great patterns that are easy enough for us beginners to use. The results make us look like we are “seasoned” quilt makers! Your stars from HST’s is a wonderfully workable concept. Thanks so much. your trunk show was overwhelming! quilts and make mine better. I have seen your Labryrinth pattern for a couple of years. Decided to purchase it and wll let you know how it turns out. Wish me luck!! !